The collection of Early Italian paintings in the Museo Thyssen-Bornemisza has two works by Bernardo Daddi: the present Virgin and Child and a Crucifixion. From their dimensions it can be deduced that both would have been painted for the purposes of private devotion. Following Giotto’s death, Daddi became the leading Florentine painter and ran an active workshop from where he developed a range of artistic formulas that would prevail until the second half of the 14th century. 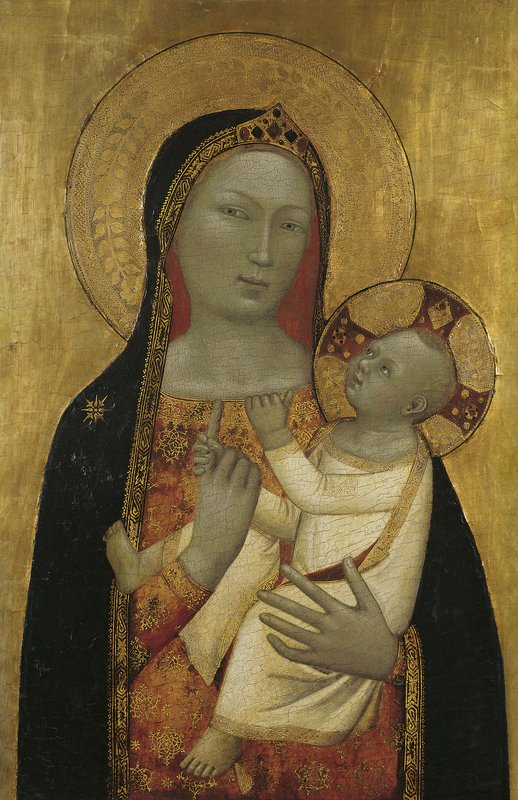 This panel of The Virgin and Child entered the Thyssen- Bornemisza collection in June 1928, purchased from a Lucerne gallery who had owned it since at least the previous year. The earliest concrete information on its provenance dates back to the 19th century when it was recorded on the Florentine art market in the late 1860s. It was subsequently recorded in the possession of three British families. In his study of the painting of 1990 Boskovits suggested that it might originally have been painted for Pieve di San Giovanni Maggiore. The panel was first published by Helen Comstock in an article of 1928 that included a reproduction of the work. The article noted that it had been exhibited that winter in New York and that it belonged to Böhler & Steinmeyer in Lucerne. The panel was the subject of study throughout the 1930s and various authors described it as being by an important Florentine painter. Only Offner considered it to be by a workshop assistant. This type of Madonna was one of the most frequently repeated motifs in Daddi’s workshop. The Virgin is presented holding the Child, located against a gold background. Gold is also used in the haloes and draperies (on the borders for the pattern on Mary’s tunic). This type of Virgin, whose iconography derives from Byzantine art, developed in western art into a type known as the “Virgin of tenderness”, and was repeated with numerous variants. In the present panel Daddi’s arrangement of the two figures is determined by the gesture of the Christ Child as he looks affectionately at his mother, holding one of her fingers in one hand while the other clutches the neck of her tunic. The Virgin, with a gentle expression, looks straight ahead, ignoring Christ’s gestures of affection. The movements of the hands, in particular the Virgin’s, were used by Daddi on other occasions, for example in the Bargello Triptych. The Christ Child’s gesture has been interpreted as an allusion to his future Passion. The new approach introduced into painting by Giotto is evident in the present work in the artist’s concern to convey the volumes of the figures. Daddi imbued them with sweetness and lyricism, reducing the rigidity and sense of distance created by the traditional gold background. The panel, which was poorly restored at an unknown date, has a triangular-shaped top. According to hypothetical reconstructions, the panel must have formed part of a polypytch of which it would have been the central image. The ensemble, dismantled at an unknown date, would have included two more paintings, according to Cohn, or four, according to Boskovits. According to the latter’s hypothesis, on the left would have been a Saint John the Evangelist and Saint James the Greater, and on the right a Saint John the Baptist and a Bishop Saint. All these works are now to be found in various collections. The works by the artist that have been used as comparisons to establish a dating for the present panel are the Saint Pancrazio Polyptych in the Uffizi and the Orsanmichele Madonna, also in Florence. These two works have a volumetric approach to the figures that is comparable to the present panel, while more specifically similar are the manner of defining the Virgin’s tunics and the construction of the heads of the Christ Child. In arguing that this is an autograph work by the artist, Boskovits has pointed out that in Daddi’s last phase his style became more monumental while his figures were capable of conveying human sentiments, despite their simplicity.